Today, I experienced the most liberating feeling of all. I needed binders, so I took the contents of 2 binders (both full of worksheets at least 2 years old) and put the papers straight into the recycle bin. I didn't look through it. I didn't save anything. I got rid of all of it. It was so freeing knowing that clutter was gone from my closet for good. I hadn't looked at these papers in 2 years. They are from a grade and subject I no longer teach. So why did I still have them? And honestly, if I was ever teaching the same content, I would find new materials. I am the type who believes that every school year is a new year, and my teaching should be fresh as well. I can't have fresh lessons when teaching from lesson plans from two years ago! Want a life changing experience in less that 5 minutes? De-clutter some of your old worksheets, lesson plans, and outdated materials. You will feel better and future students will thank you. A song that often comes on my favorite Pandora channel is First Day of My Life by Bright Eyes. It's a catchy song that I enjoy but never really listened to. 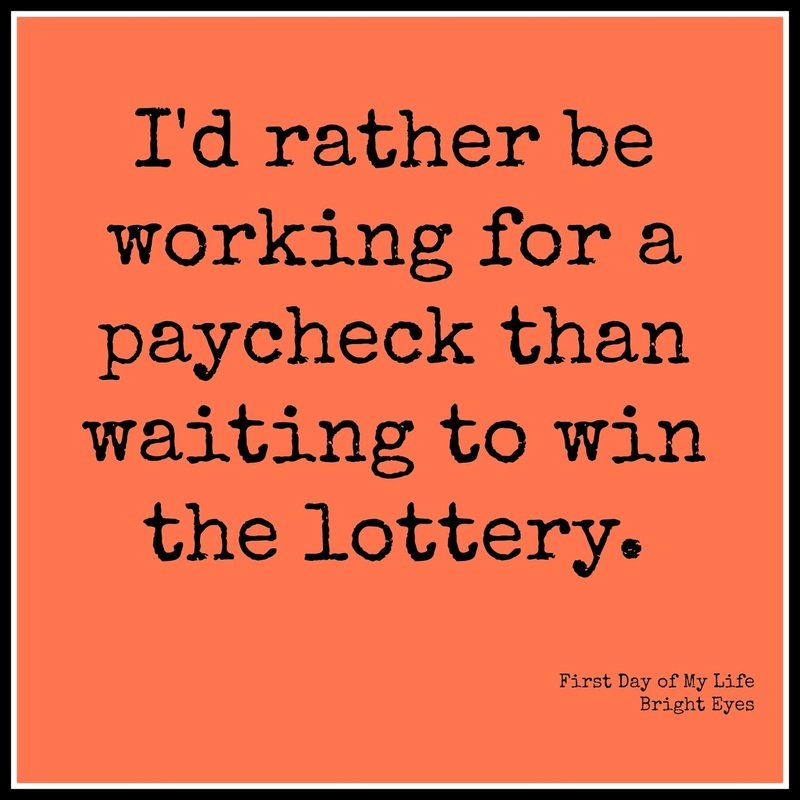 However, today I heard a lyric that stood out and spoke to me: "I'd rather be working for a paycheck than waiting to win the lottery." This fits many of the things I have heard from teachers lately. They want to use more technology. They are unhappy with classroom management in their classrooms. They wish the others knew about the innovative things they are trying. They simply wish to be a better teacher. Why are you waiting on someone or something to come along and transform your teaching? Taking charge of your own professional growth is the key to success. You are the one who determines the success or failure of your own classroom. Go ahead, read that professional book that you haven't had time for, follow up on some of those ideas you have Pinned, participate in a Twitter chat (the first one is always crazy, but after that you get the hang of it). 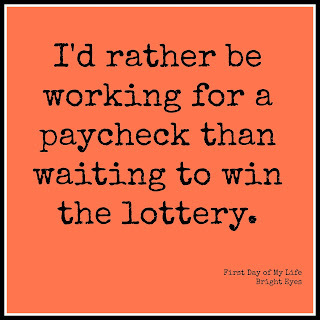 After all, the only way to win the lottery is to buy a ticket, and the only way to change your classroom is for you, the teacher, to grow! Presentations- Taking the time to do it right! Now that state testing is finally complete, I want to shift the focus in my classroom to presentation skills and making "academically professional" products. Students at the elementary level simply haven't been taught to create digital posters, iMovies, or presentation slides. The result is often a cluttered, plagiarized mess. The first "academically professional" product I set out to teach my students to create was a presentation. We tied this in with our science adaptations unit. 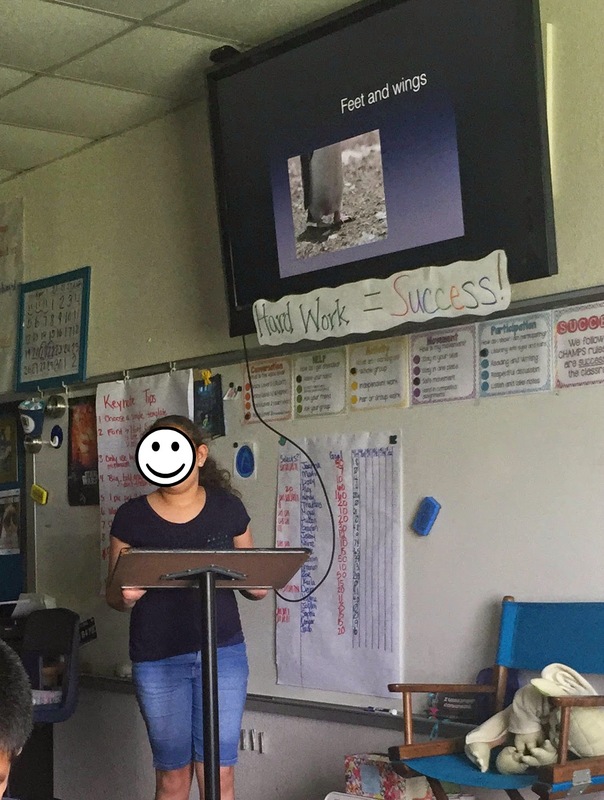 In our research on animal and plant adaptations, my students found many unique and interesting adaptions that they were wanted to share, so a presentation seemed like the perfect product. We started by learning what makes a good slide. I showed a great Youtube video by Tim Bedley. This video worked well because it was geared toward kids and it had non-examples that really illustrated what makes a good slide. As we watched, I made an anchor chart with all the tips so my students had a visual reminder as they worked. I was a little nervous when I let my students start making their presentations in Keynote, because in the past the slides they created were a mess. (But, I had never taught them how to make a slide.) Thankfully though, I was utterly amazed with their presentations. Their slides ended up looking neat and professional. They were not cluttered with stickers and emojis. They limited the number of pictures they put on each slide, and even more, they ensured that the pictures enhanced the presentation. I couldn't have been prouder! Their presentations were amazing too. I could tell that my students had a strong grasp on the content. They were able to tell me about the adaptations to the detail I required. Most faced the audience instead of their iPad and took questions from the audience. All-in-all, this presentation took 2 days. That includes research, creating in Keynote, presenting, and reflecting on the experience. But honestly, it was worth it. I am planning to move this lesson to the first of the year in the future. I can only imagine all the opportunities my students missed because they were not able to create a presentation, which cause me not to assign them. In the next few days, I am going to use the same research to show them how to create an academically professional iMovie. I am so excited! Give the students a specific academic focus. For adaptations, I wanted them to be able to tell me the structure and the function of the adaptation. This allowed the students to know what I was looking for when grading, and it helped them to stay on focus. Reflect, reflect, reflect. A lot happened in these two days. The students were able to learn about their own abilities, as well as see the work of others. The reflections gave them a chance to think about how they did and what they can do next time to be even better. Go over the terms: PowerPoint, presentation, Keynote, and slides. The video said PowerPoint even though we used Keynote. Students should know that these terms all refer to the same process. Discuss digital citizenship before you start the project. Remind kids that images should be copyright-free and they should attribute them to the source. Also discuss plagiarism and not stealing someone else's words. I admit it. I am addicted to Task Cards! I spend more on Teachers Pay Teachers than I would like to admit. This year however, I am trying something a little different... I am making my own task cards! The advantages to making my own task cards are endless. I can make them in black-and-white (who has access to all that color ink anyway! ), I can make them plain and without all of the frills (seriously, how do cute, pink owls help my students), and I can add my own questions. I recently created some sets for measuring angles, which is a new 4th grade standard this year. I started in PowerPoint. Many of the great TpT sellers use PowerPoint to make their task cards, and I can see why. It is very easy to use and manipulate. The first step was to divide the "paper" in half. I chose to make these task cards bigger so that the protractor can fit on the angle better. If you want your task cards to be smaller, just divide it into fourths. This will also serve as a guide line when cutting. I then inserted a text box on both sides which provides the borders for my cards. The images of the angles were purchased from Teachers Pay Teachers. There is a lot of clip art available. In addition to content graphics, you can also get the "cute" clip art that many sellers use. To get graphics on your task card, you simply insert the image, position it, and re-size it to your fit your needs. I purchased the angle clip art from: https://www.teacherspayteachers.com/Store/Fun-For-Learning. She also has some great number line clip art available. If you are looking for the cute clip art, visit: https://www.teacherspayteachers.com/Store/Scrappin-Doodles. Scrappin-Doodles has clip art for all occasions and subject areas. I made my QR codes at: http://www.qr-code-generator.com/. I love how easy technology makes it for students self check their work! Adding QR codes seems difficult to many teachers who are technology newbies, but they are in fact very simple. On the QR code generator's web-site, simply enter the text, number, or URL you want the code to display. The site will create you a QR code with your information. Then you can save your QR code to your computer. I personally did not want to save 50+ QR codes in order to make my task cards, so I used the Snipping Tool to "snip" an image of the QR code. I then copied the image into my PowerPoint. Here is a free version of my Measuring Angles Task Cards! I hope you and your students enjoy them!